I will be in in Columbus ohio at Origins Game Fair from Thursday June 13 to Saturday June 15. I am looking for people interested in playtesting Chronicle. Anyone interested in playtesting should hit the contact link at the top of the page and send me a message with a working return email (which I will not use for anything else). Please put Origins Playtest in the subject field. I will be in Mamaroneck, NY tomorrow evening to playtest Chronicle at Modern Myths. Saturday night is board game night and They have graciously allowed me to set up shop and con people into playing my game. There must be a way to crosslink square space to Facebook, right? On vacation from my day job. Wife is sitting on the bed next to me reading Ken Follett's The Pillars of the Earth. Just finished editing the first round of content. Got my live.com email and (theoretically) a facebook product page. Anyone know how to enable people to link to a facebook product page? Going to send a link out to my facebook peeps and get their feedback. Wish me luck. I think I've finally got the hang of the square space engine and I'm adding content to the site. Its a bit early yet, but it finally feels like this thing is becoming real. I also got the fifth piece of fill in art from Steve Prescott today. The vast Majority of art for the game was produced by Lief Jones who has unfortunately left the field of illustration to try his hand at pop art surrealism. But for a few months several years ago Leif produced a staggering amount of beautiful art which I will hopefully get to share later this year. But since Leif has gone on to (hopefully) greener pastures I needed to find another artist to help fill a few gaps, and (again, hopefully) provide some additional art in the future for an expansion or two. Steve graciously agreed to squeeze me into his busy schedule. 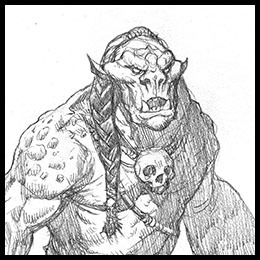 After all, it would be difficult to have a fantasy game full of monsters and not have a Orc in the deck. So here I am, trying to set up my square space site. I expected square space to be a little more intuitive, but hopefully I'll get this thing hammered into shape. I suppose this is enough of a first post, it will at least show me if the spacing at the logo is working the way it is supposed to.